Integration between your data in MyRotary (the RI Global Database) and the RIBI-Template is now here! There will be no more needing to enter your data into two databases and on top of that the Database Management System (DMS) brings back lots of the functionality the now defunct MDE previously gave your clubs. In the past, Secretaries and/or Club Administrators have had to maintain two sets of databases for Rotary; the Rotary International one, and the RIBI one. The latter has much more comprehensive information and is used by districts to ensure emails are sent to the relevant people as far as possible. In the future it will mean that emails will be more targeted – e.g. just going to the relevant person in each club directly rather than a more global distribution thus decreasing the workload of secretaries to forward information. However, previously it has been a pain for club secretaries to maintain both databases, so the result that is has been easy for them to be out of sync. A team of experienced Rotarians, along with RIBI, have been developing a synchronising facility which should significantly streamline things in the future. However, the first step is to ensure that both databases are consistent and that needs a once off detailed check with only periodic checks in the future when changes are made. Indeed it will only be necessary to change things on one database and the new facilities will permit an automatic sync of the data. The system will initially synchronised to only push data from the RIBI Template database up into the RI Global database until RI finish code development for this to be a two way process. Your club(s) needs to set the Vendor Partner Organisation* in the Club Administration area of MyRotary as “RIBI Data Integration” (see ‘how-to’ guide here). Please double check you have selected the correct ‘vendor’ as we have had reports of some clubs not doing so. This is required to link the two systems together and each club needs to do this. It is a simple process with the ability to set this link restricted to the specific Club Roles as follows: Club President; Secretary; Executive Secretary; Treasurer; Foundation Chair; Membership Chair. If you do not hold one of these positions in your Rotary Club, you will need to ask one of your members with these access rights to set the link for you. Please download this ‘how-to’ guide to learn how to set the Vendor Partner Organisation. *‘Vendor Partner Organisation’ is the terminology RI have used. Whilst we might not recognise this in non-US business speak, it is just referring to the linkage between the two databases as the RIBI-template database is technically a ‘supplier’ to the RI database. 3. From the sub-menu select Officers. 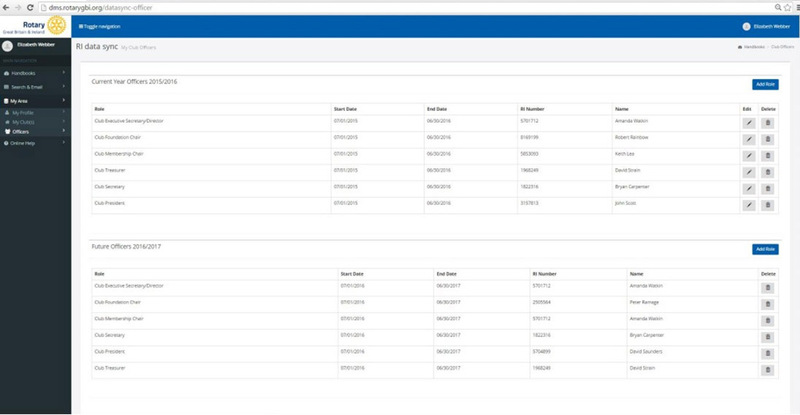 When the Officers tab has been selected, the system will retrieve data held in the RIBI Template database and the RI Global Database, populating the DMS screen with the results. If a post has been assigned to different people in each of the two databases, it is the RI Global database information that will be taken as the master data. If the information needs to be corrected or added to, you can make changes from this screen which will lead to updates being made both databases in real-time. 5. If all officers are correct, you can simply exit the screen at this point as synchronisation will be complete! 1. To remove a person from a role click on the trash can icon. You will receive a confirmation prompt, select delete to remove the post, cancel to return to the record. This function is designed to enable a post holder to be changed without removing the history of their time served. The edit function reflects a change in the end date for the post. Simply enter the date and click the green button ‘Push to RI Global Database’. 3. 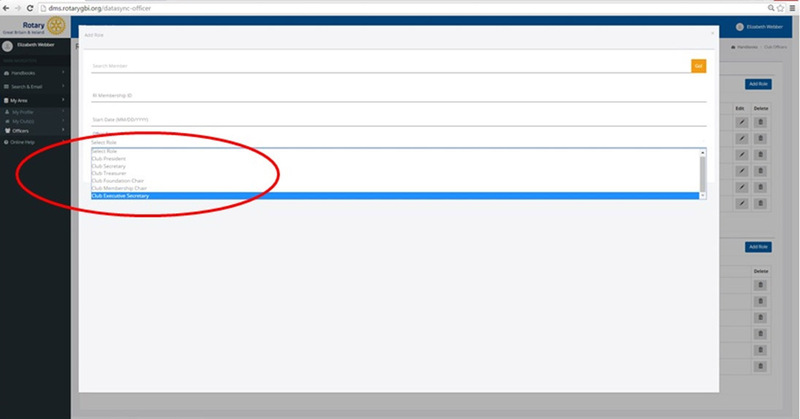 To add a role: click the blue ADD button (for either current year records or future year records). If you add a record for the current year, you will be asked to enter the start date for that role. This allows for changes part way through the year as required. When you add a role for the future year the end/start dates are assumed as 1/7 and 30/6 respectively. The roles that can be assigned through the DMS are limited to the six roles recognised by RI, namely: Club President; Club Secretary; Club Treasurer; Club Foundation Chair; Club Membership Chair. Generally, Club Officers should be assigned through the RIBI Template to ensure that ALL roles are correctly identified and therefore become available in Handbooks, emails and search facilities. To assign a member to one of the six roles, select the member by either clicking on the orange GO! button and choose from the club member list, or type part of their name and press enter. To make the selection, click the pencil icon. Select the role from the drop down list (as in the screen shot in above); enter the start date if the assignment is for the current year; click the green button ‘Push to RI Global Database’ to complete the process. Staying logged into the DMS, under the My Club(s) area shown above, Club Admins/Secretaries will find a list of members in your club (if you are a district admin/secretary, you will see all clubs and members here with an indicator if they still need to link the databases as per Step 1. Until November, it had been possible to enter the RI Number into RIBI-Template. However, numerous errors resulted in the two datasets not matching so the ability to add the RI Number by club officers was suspended to avoid this in the future until now when many of the records have been matched (painstakingly) by manual procedure. This has now been re-opened for District Administrators and District Secretaries only to complete any final synchronisation issues clubs need to correct. b) When you click the green sycn button, if a name appears which is already on the database, then accepting any member displayed as being on the RI Global database but not RIBI Template system may result in a double entry for that member. If that happens it is possible to resolve the issue by using (with caution) the red cross at the right hand side to ‘terminate’ that member. A warning message will appear before a termination flag is put next to the member on the database, and please make use of the option to note the member as either ‘terminated’ (i.e. left the club), or ‘deceased’ (i.e. member has passed away/died). By selecting deceased you will stop any unwanted or upsetting mailings being sent to that member by RI. 5. Please note that pushing a blank field will overwrite, i.e.delete, any data that exists in the corresponding field on the other side. For example, if you’re pushing RI Global Database data to the RIBI Template, to correct an address line, and you have a phone number on the RIBI side but not RI, the blank RI field will overwrite the number in the RIBI field. Many people may assume that a blank field will just be ignored by a field with data, whereas it will actually replace it. 7.Check that all is well on the left hand side, then go to the bottom left hand side and click ‘Save and Push to RI Global Database’. 8. Alternatively, if all the data is correct on the RI side, go to the bottom right hand side and click ‘Push to RIBI Template’. 9. The screen will go opaque for 5–10 seconds, and then a message will appear that the record has been successful in updating. You will see the page refresh, then you can close that member screen. If it has been integrated correctly, the red cross will change to a green tick. 10. Once all members have a green tick, you’re done! Congratulations and thank you! Please note that pushing a blank field will overwrite, i.e. delete, any data that exists in the corresponding field on the other side. For example, if you’re pushing RI Global Database data to the RIBI Template, to correct an address line, and you have a phone number on the RIBI side but not RI, the blank RI field will overwrite the number in the RIBI field. Many people may assume that a blank field will just be ignored by a field with data, whereas it will actually replace it. For house names avoid using “inverted commas” around the name of the house – these will not be accepted. In some cases it appears that the postcode is identical, but there is a cross indicating incompatibility. Often the reason for this is different numbers of spaces between the primary and secondary parts of the postcode; i.e. AB1 9YZ and AB1 9YZ would report an inconsistency as there is one space in the first entry and two spaces in the second entry. If the information on the RI side is correct, but not on the RIBI site, it is possible to copy the RI information to the RIBI side. On some machines one can drag and drop on others one can use usual shortcut keys – i.e. CTRL+C to copy and CTRL+V to paste. In this synchronisation, you are only completing the shared fields between the two databases. The RIBI Template database itself has many more fields you can fill in which are useful for the other DMS functionality (such as handbooks, search and email). If you need assistance with this, please follow the information on the template support page. The databases now synchronise in two directions so we ask that Club Admins, perhaps on a once a month basis, do a bit of house-keeping by taking a look in the My Club section to see if any red-crosses are present – thus indicating that a member record requires a bit of attention. This shouldn’t prove to be an onerous task as once the initial sync has been completed and records brought into line, changes to member details don’t happen that frequently in reality. Any questions or concerns you may have on the Data Management System should be emailed to dms@rotarygbi.org – this is a specific email account for support purposes to ensure we don’t lose questions/queries in the everyday activities of the Rotary Support Centre. Alternatively you are likely to have district support available as well as district secretaries and admins have had an additional couple of weeks to learn, and help us iron out the system.